Blackbeard's Head & Bell Recovery Video Released! The infamous pirate Blackbeard ran his flagship, the Queen Anne's Revenge, aground just outside Beaufort Inlet, N.C. in June of 1718. He was later killed in a fierce battle near Ocracoke N.C. in November of 1718. Since the 1996 discovery of the wreck by Intersal, Inc. 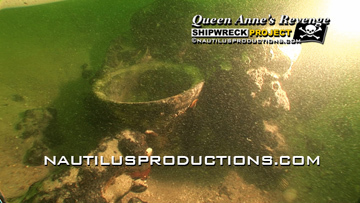 The Nautilus Productions staff has been the official video crew for the study and recovery of the infamous pirate Blackbeard's ship the Queen Anne's Revenge (La Concorde). Project videographer, Rick Allen, and our staff have worked with the North Carolina Underwater Archaeology Branch documenting this incredible underwater find. Nautilus Productions' duties have included the video documentation of site activities above and below the water as well as documenting the archaeological survey, provenience and recovery of artifacts from the shipwreck. This archive is the digital record of the project. Our Queen Anne's Revenge stock footage and images have been licensed worldwide in books, magazines, news broadcasts and in over a dozen documentaries airing on ABC, BBC, CBS, CNN, the History Channel, Discovery, National Geographic, NBC, PBS, the Smithsonian Channel, the Travel Channel, ZDF and more. Nautilus Productions' owner and project videographer, Rick Allen, has also been featured on WUNC Radio & NPR's "The Story" - Blackbeard's Shipwreck And The Hook and in numerous news stories and magazine articles. Nautilus Productions & Blackbeard on the BBC!